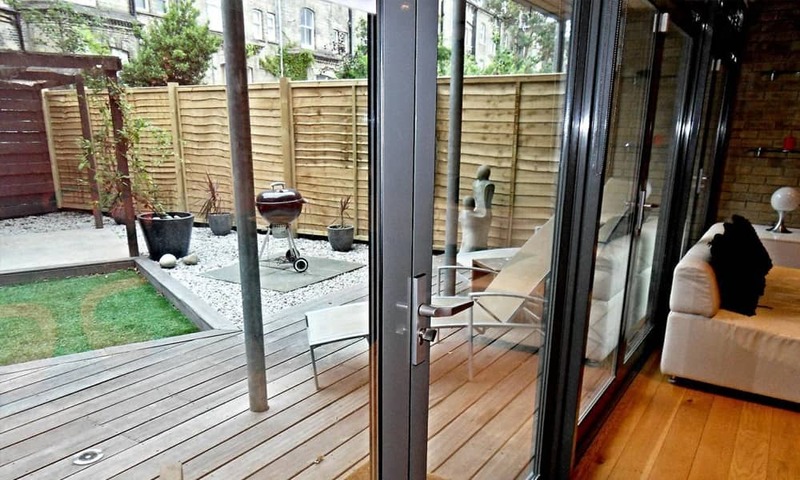 Stagwoods House is a stunning contemporary mews house that has been architecturally designed with huge floor to ceiling windows and sky lights, wooden floors throughout and white walls with feature retro wallpaper. The ultra cool living/dining room has a huge 60" HD TV with Sky HD and is the perfect space for chilling out, chatting and watching a DVD. The house can sleep up to 10 with 2 double bedrooms, a king-size double leather sofa bed in the lounge, and 2 single fold-out foam chair beds in each of the bedrooms to accommodate a further 4 guests. The modern kitchen has white gloss units and orange worktops and black Bosch integrated appliances. 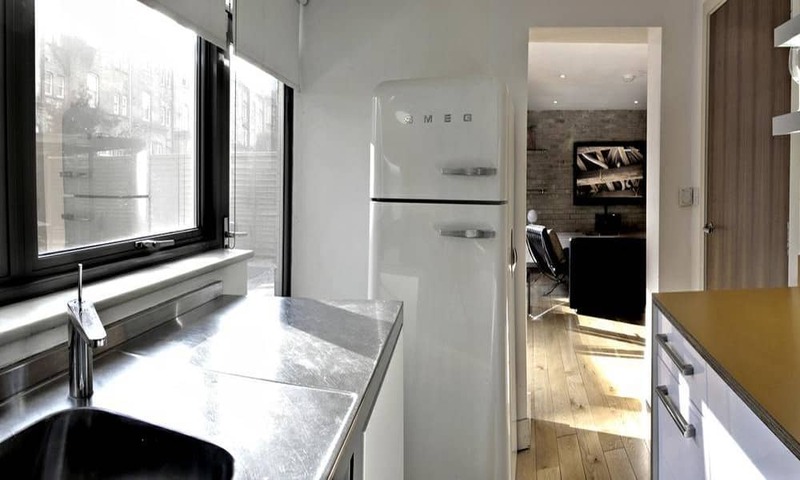 There's everything you will need for your weekend stay including a Smeg fridge/freezer, dishwasher, microwave and blender. The kitchen is situated directly next door to the living areas so perfect for entertaining. The lounge area has a large soft black leather 3 seater sofa and 2 chairs. The retro glass dining table can seat up to 8. There is a 60" flat screen HD TV with the full Sky HD pack. There is a Blu-Ray player plus Wii. Original 1970's wallpaper combines with luxury leather designer furniture. Large doors lead out into the designer decked garden outside. A must for any Elvis fans in your group as this this bedroom has Elvis wallpaper! 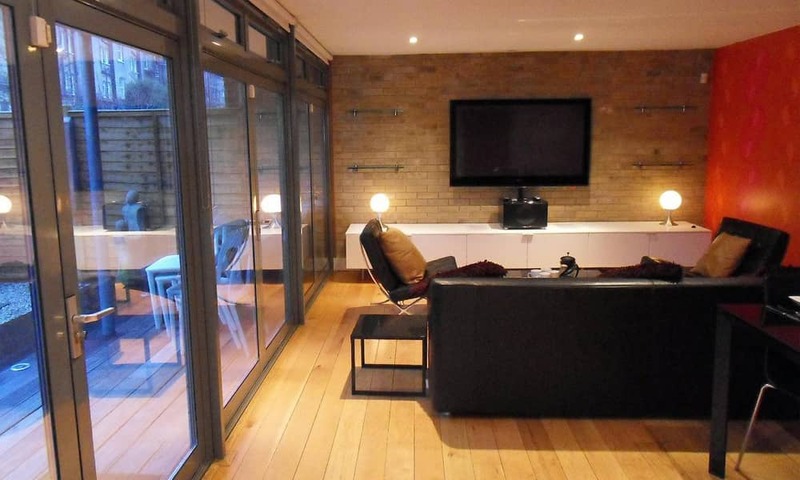 Large windows let the light stream into the room, together with skylights in the roof. There is a large plasma TV on the wall. This bedroom sleeps up to 4 guest in a large double bed and a further 2 single, fold-out foam chair beds. The second bedroom is bright and airy with floor to ceiling windows overlooking the gardens and surrounding architecture. Sleeping up to 4 guests in a double bed with 2 single, fold-out foam chair beds. There is an en-suite shower room with power shower and hotel style basin and toilet. The modern newly fitted bathroom has white & chrome fittings and fixtures with whirlpool spa bath and shower. 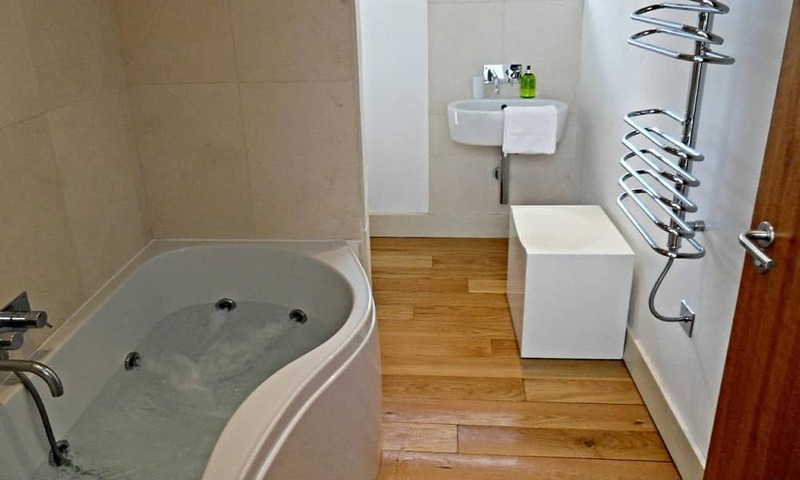 For maximum comfort, the bathroom has underfloor heating and Mood lighting with 15" waterproof LCD TV. 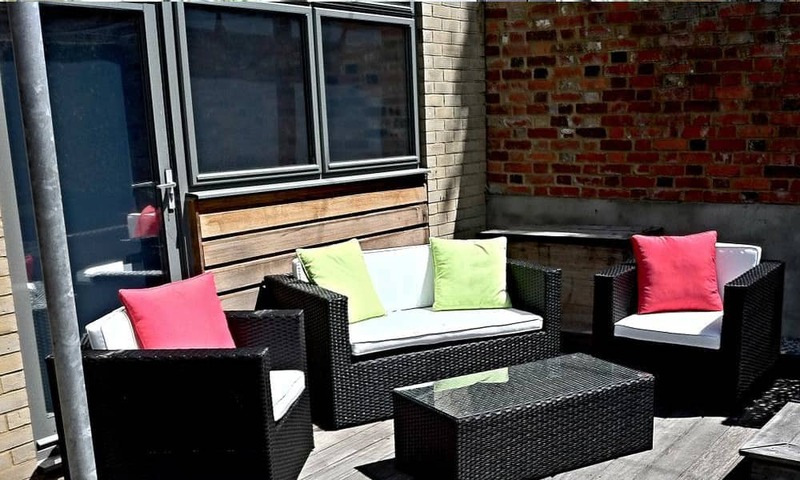 Outside there is a cool landscaped garden which is perfect for your group to socialise in. There are decked areas and a covered section. The decked area is beautifully lit with recessed spotlights at night. Under a bamboo gazebo is dining room seating, plus silver loungers, benches and even a Balinese day bed complete with exotic cushions and throws. There is free parking for two vehicles.